Poorly maintained Bronx sidewalks can lead to trips, slips, falls and other accidents that result in injury. If you have been injured in a slip-and-fall or trip-and-fall on an NYC sidewalk, our firm can help. The city is aggressive when defending these cases and will attempt to shift blame to the injured person or a nearby property owner. The Orlow Firm has substantial experience helping injured Bronx residents seek compensation in complicated injury claims. Have you been injured in a fall on an NYC sidewalk? 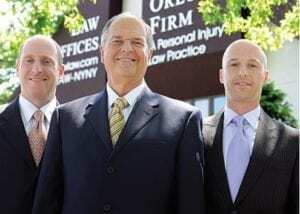 Call The Orlow Firm at (646) 647-3398 to schedule your free consultation with one of our lawyers. You may also submit a contact form and we will be in touch with you promptly. When you bring your case to our law firm, you will always work with a named partner. We believe you should expect nothing less from the firm who handles your injury case. The Orlow Firm was established in 1981. Our attorneys understand the potential problems of everyday life in the city. We use the sidewalks and the public transportation systems. We understand that when a slip-and-fall accident, bus accident or subway accident occurs, you want answers and you want to hold the negligent party accountable. Whether you suffer broken bones or an injured back, we take your trip- or slip-and-fall accident seriously. During the past three decades, our attorneys have obtained numerous verdicts and settlements for premises liability claims. Among them, a woman who tripped and fell while walking on a sidewalk that was raised received $250,000. The woman required two surgeries for her injured knee. If you have been injured in a sidewalk fall, you must act quickly. You must file a written claim within 90 days of your accident or you will lose your right to pursue the claim. The claim must be filed with the municipal agency where your accident occurred. By doing this, you can remove one of the roadblocks to successful resolution of your claim. Our firm can help you with this written notice. To learn whether you have a potential legal claim for an injury suffered in a fall on a sidewalk, contact us today. Our qualified and experienced Bronx premises liability lawyers will offer a confidential and honest assessment of your case. Contact us online or call (646) 647-3398. Se habla español.